You may not know who Frank Zappa is, chances are if you’re under 40 you don’t. Maybe you do, but are wondering why you should care about this total freak show who created vulgar über wacko performance art concerts before that was cool? Oh and now you want to know when I’m going to get to the point? So Deep Purple was there, at the Montreux Casino in Switzerland, when some crazy Zappa fan shot off a flare gun that caused the whole Casino to burn down. And you didn’t even realize that without Frank Zappa you wouldn’t even be able to jam to Smoke on the Water. Frank had a gift for identifying and attracting amazingly talented musicians. Did you know you might never have heard of Missing Persons, Talking Heads, King Crimson,The Doors, Berlin, Steely Dan if it wasn’t for Frank Zappa? Maybe you’re more of an 80’s fan? Did you know it was one of his discoveries that wrote and produced this little number to win an Academy Award? What’s that you said? Sting and Frank respected each other so much that Sting decided to join Frank on stage in Chicago and let them Zappaize Murder by Numbers? Right, and some guy named John Lennon decided to hang out on stage with Frank and his band. And then there are the musicians who played in bands you know so well, or who supported the amazing vocalists of our time! Arthur Barrow who played mostly bass and composed, played with The Doors, Joe Cocker (the 91/2 Weeks Soundtrack), Diana Ross, Janet Jackson, Nina Hagen, Berlin (for which he won an Academy Award), Charlie Sexton, Oingo Boingo, The Motels. He did the soundtracks for: Top Gun, Scarface, The Doors, The Breakfast Club, The Never Ending Story, Electric Dreams, Quicksilver D.C. Cab, Iron Eagle, and The Twilight Zone. Max Bennett played Bass Guitar with Peggy Lee, Ella Fitzgerald, Joni Mitchell and Joan Baez through the 1970s. He also recorded with Charlie Mariano, Conte Candoli, Bob Cooper, Bill Holman, Stan Levey, Lou Levy, Coleman Hawkins and Jack Montrose. The Monkees and The Partridge Family, Joe Sample, Larry Carlton and John Guerin. Terry Bozzio percussionist extraordinaire played with Jeff Beck, Robbie Robertson, Dokken, Richard Marx, Duran Duran and The Knack, to name a few. Michael Brecker saxophonist (won 15 Grammy Awards!) played with Todd Rundgren, Patti Austin, George Benson, Pat Methany, Art Garfukel, Frank Sinatra, Chick Corea, Dan Fogelberg, James Taylor, Dave Brubeck…. and more! His brother Randy Brecker – trumpet -Played with George Benson, Blood Sweat and Tears, Gato Barbieri, Lou Reed, and many jazz musicians you would recognize if you heard! Eric Clapton. Did I say Eric Clapton? Vinnie Colaiuta – drummer – Played with Joni Mitchell, Sting, Megadeath. Chuck Domanico backed up Frank Sinatra, Barbra Streisand, Carmen McRae, Joni Mitchell, Taj Mahal, Diane Schuur, Natalie Cole, and the group Manhattan Transfer. Aynsley Dunbar on drums founding member of John Mayall & the Bluesbreakers, played with David Bowie, Lou Reed, Nils Lofgren, Journey, Sammy Hagar, Jefferson Starship, and Whitesnake. Tom Malone was the trombone player for The Blues Brothers. Jean Luc-Ponty Violin, if you don’t know him you need to. And who couldn’t wait to be a part of Frank Zappa’s next project? John Lennon – guessing you know who that is and his wife Yoko. am I done yet? There is just…..so…..much…..
Give Frank a try, he left an amazing legacy behind. He was crazy, wild, amazingly talented, free thinking, and innovative. Everyone wanted to know him, the musicians of his time wanted to play with him, and he was just as happy to have everyone around. I know, I can’t count. How about you? 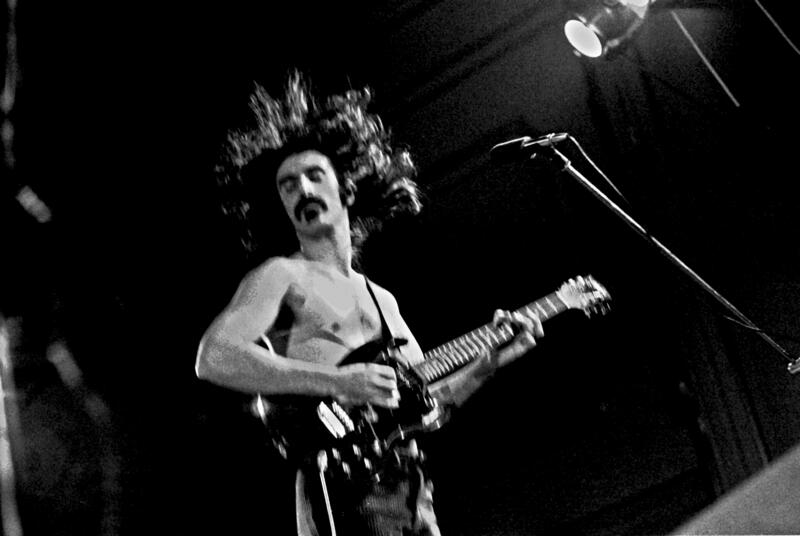 Do you have a favorite Frank Zappa song or story? Or maybe an origin story about another band? I’d love to hear! I love Apostrophe and Overnite Sensation, I also LOVE Joe’s Garage. I think there is something to love on every Frank Zappa album, it just depends which one you got hooked on first! Thanks for stopping by! Great summary of the legacy of Frank Zappa!